The Tesla Model S is a full-sized all-electric five-door, luxury liftback, produced by Tesla, Inc., and introduced on June 22, 2012.It scored a perfect 5.0 NHTSA automobile safety rating. The EPA official range for the 2017 Model S 100D, which is equipped with a 100 kWh (360 MJ) battery pack, is 335 miles (540 km),higher than any other electric car. The EPA rated the 2017 90D Model S’s energy consumption at 200.9 watt-hours per kilometer (32.33 kWh/100 mi or 20.09 kWh/100 km) for a combined fuel economy of 104 miles per gallon gasoline equivalent (2.26 L/100 km or 125 mpg‑imp). 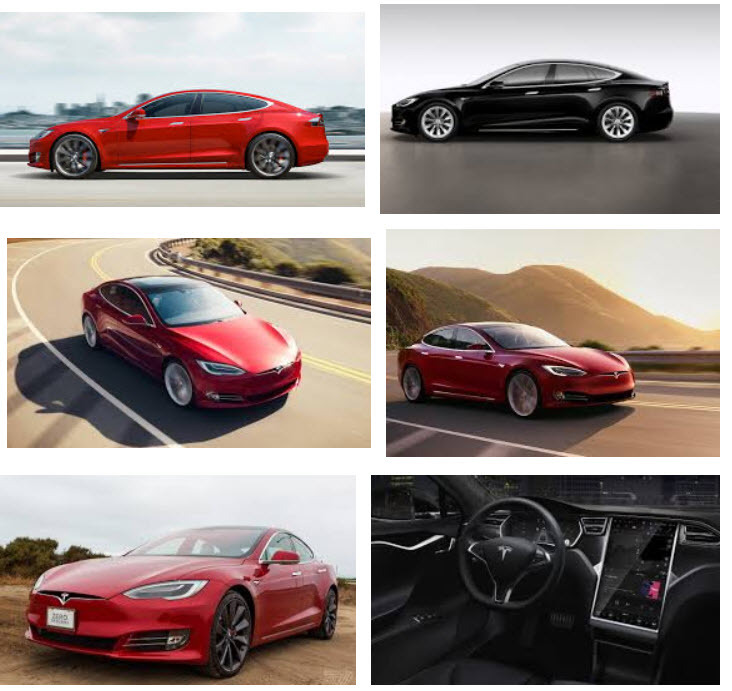 In 2016, Tesla updated the design of the Model S to closely match that of the Model X. As of October 2017, the following versions are available: 75D, 100D and P100D. In 2013, the Model S became the first electric car to top the monthly new car sales ranking in any country, twice leading in Norway, in September and December 2013 and also in Denmark in December 2015. Global Model S sales passed the 200,000 unit milestone early in the fourth quarter of 2017. The U.S. is its leading market, with about 119,000 units delivered until December 2017. The Tesla Model S was the top selling plug-in electric car worldwide in 2015 and 2016. The Tesla Model S was the 2013 World Green Car of the Year, 2013 Motor Trend Car of the Year, Automobile magazine’s 2013 Car of the Year, Time Magazine Best 25 Inventions of the Year 2012 award and Consumer Reports top-scoring car in its road testing. In 2015, Car and Driver named the Model S the Car of the Century. After not recommending the Model S in 2015 due to poor reliability, one year later, Consumer Reports added the car to its recommended list.